The truth is, all the talk about face shapes is just another example of another generalization within the eyewear industry. Here's how to actually find the perfect eyeglasses for you, your face and your prescription. You’ve seen the magazine articles before. “How to Choose The Right Frame for Your Face.” For round faces, wear this. For heart-shaped faces, wear this. You look in the mirror. You look back at the page. You look back at the mirror. Is my face heart shaped? Is anyone’s? I guess it’s kind of round. But isn’t everyone’s? The truth is, all the talk about face shapes is just another example of another generalization within the eyewear industry. ‍Myth #1: "To choose a frame, you must understand your face shape." Truth: The internet and lifestyle magazines are littered with these unhelpful guidelines. The truth is, nobody actually looks like the options given -- it's much more likely that you're a combination of two or three of the options. Myth #2: One size fits all. Truth: Couldn't be more wrong! In the eyewear industry, all stock eyeglasses and sunglasses are mass produced in batches of 5,000 or more, all sized to fit just one mythical, "average" person. There are some variations, such as "Asian Fit," but none that are an actual, acceptable solution. 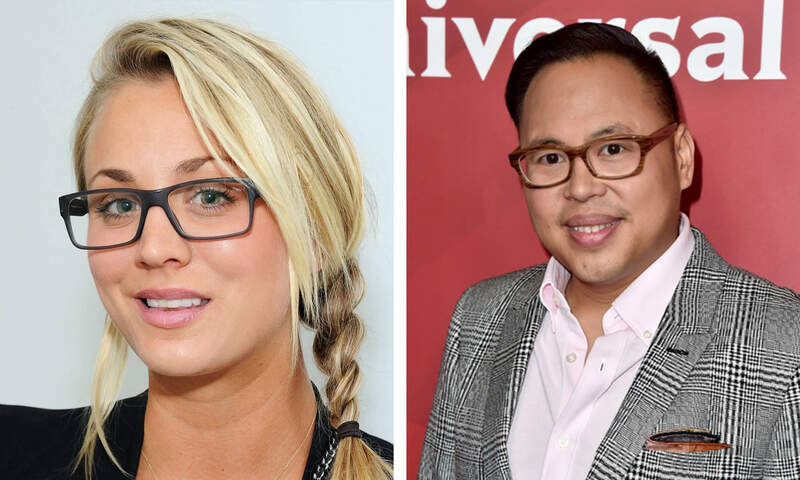 Read more about why we think you shouldn't settle for Asian Fit glasses. Myth #3: Glasses are just uncomfortable, so deal with it. 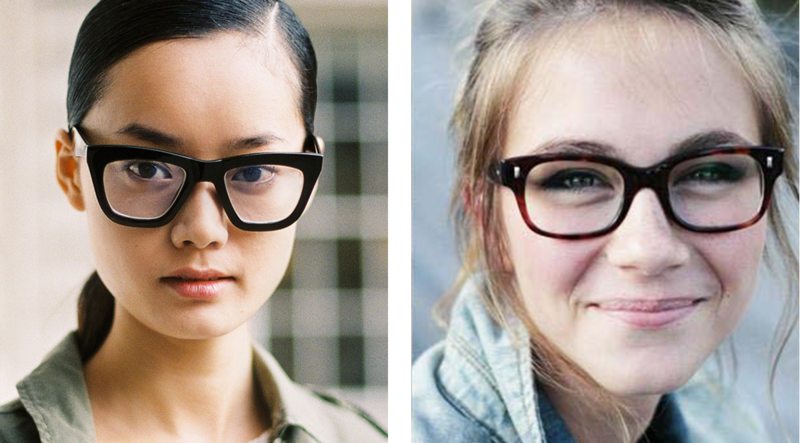 Truth: Glasses can be comfortable, and we have the customers to prove it! The reason your glasses are uncomfortable is simple: they don't fit you. This is also why glasses slide down our noses, pinch us, give us headaches or blurred vision, touch our eyelashes… The list of issues goes on and on. Have idea what style you want already but not sure about the color? Check out our guide to picking the perfect shade for your frames. How to find the perfect eyeglasses for you, your face and your prescription. A. Do you have sharp, angular features, or soft, rounded features? When selecting a frame, a good rule of thumb is to choose the opposite of your facial features. For example, a square or angular faces look great in round frames, whereas round faces and softer features benefit from the contrast of square frames. Contrast your features to create balance. Sharp, squared jaws are offset by softly curved frames. Soft, rounded features are offset by sharp, angular frames. B: Is the top half of your face wider, or the bottom half? As with soft vs. angular features, contrast is also key when evaluating the top and bottom half of your face. If the top half of your face is wider than bottom, do the opposite with your frame and vice-versa. If you have a bottom-heavy face, you want a top-heavy frame, and vice-versa. 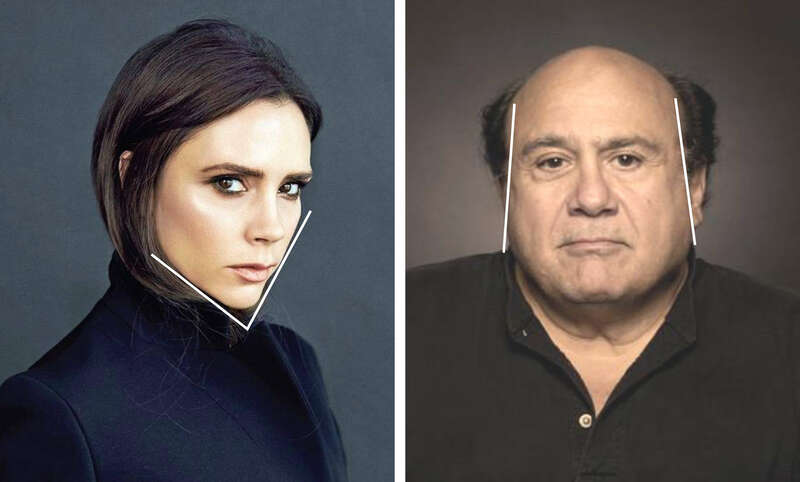 For example, Victoria Beckham has a top-heavy face while Danny DeVito has a bottom-heavy face. 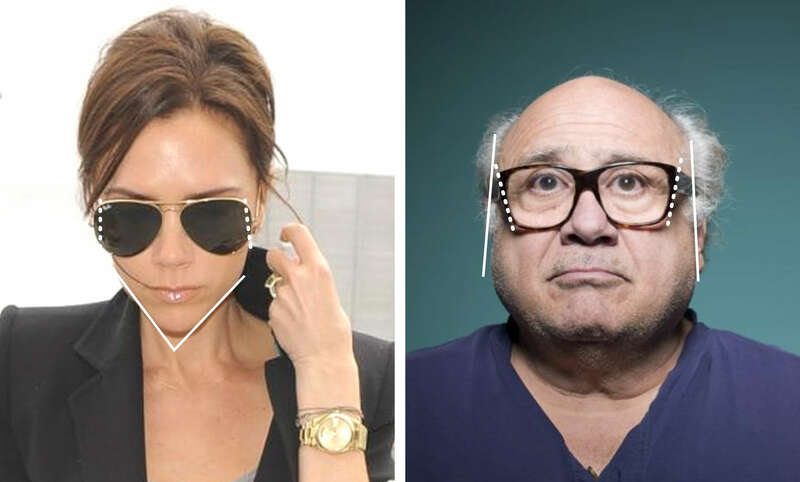 Victoria wears a bottom-heavy frame to offset the top of her face, while Danny does the opposite with a top-heavy frame to offset the bottom of his face. C: What is the look you're trying to create? The guide you're reading is meant for someone who wants to create a subtle, understated look that accentuates their face but doesn't distract. If you want to go bolder, these rules are meant to be broken! If you want a subtle or understated look, follow the rules above. If you want a bolder, more provocative look, break them! 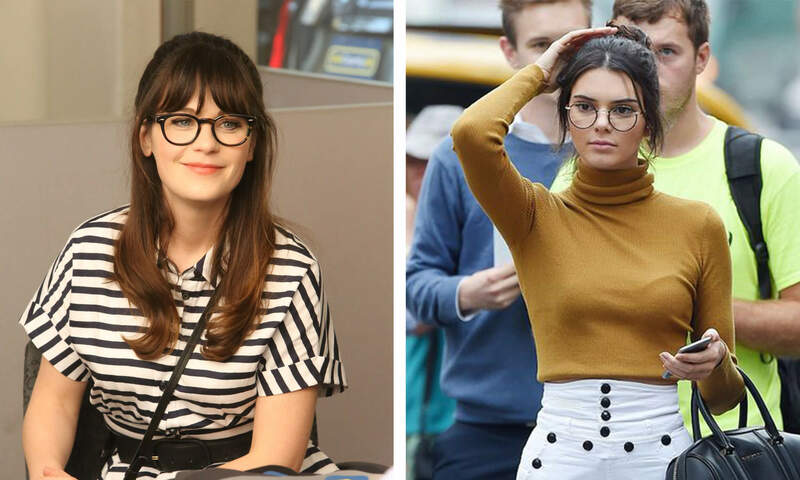 Zooey Deschanel and Kendall Jenner both have softer features, but are still able to pull off round glasses. 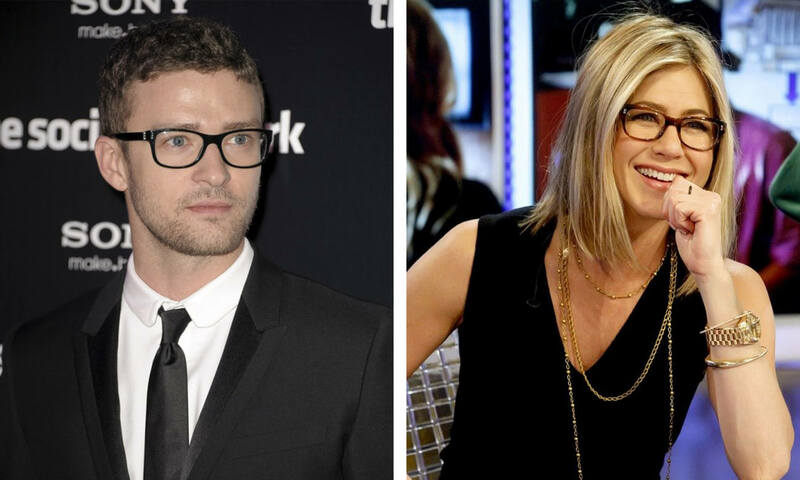 Justin Timberlake and Jennifer Aniston have more angular features, but are still able to make angular frames work. 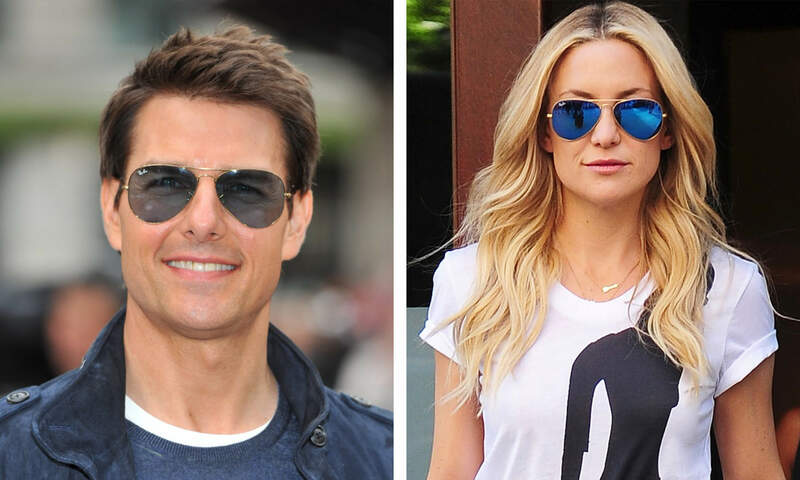 Tom Cruise and Kate Hudson both have slightly bottom heavier faces, but are still able to make aviators work for them by choosing an aviator style that is not excessively bottom-heavy. Visit our article on choosing the right color for your skin. Again, those of you seeking a bolder or more statement pair may want to read these rules - and then break them! Now you know the general shape of glasses that work for you, it's time to get the proportions just right. No suit or dress ever looks good without a great fit. A: Your face and frame proportions should match. 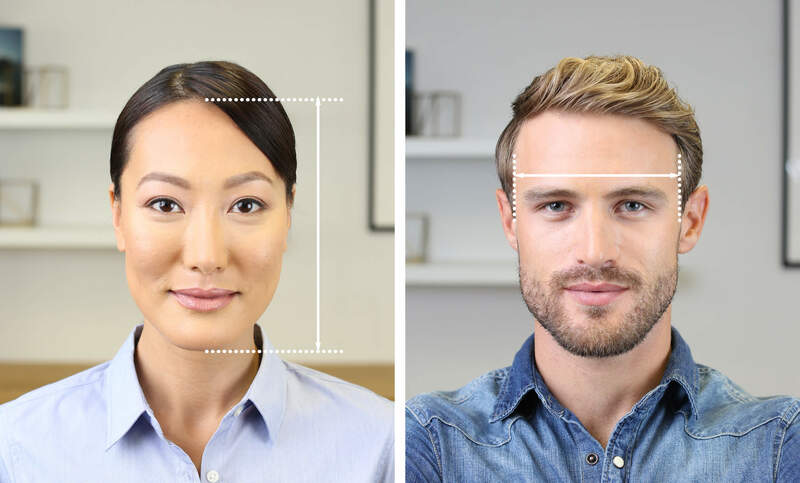 The key to finding the perfect frame is more about where your features are set on your face than the shape of your face overall. If you are buying Topology glasses, we auto-size everything around your face. But, as you have the option of adjusting proportions of your glasses, it's worth considering. Ashley (left) has a longer face while Parker (right) has a wider face. For Ashley, we increased the height of her frame to match her longer facial proportions. For Parker, we increased the width of the frame to extend proportionally. First and foremost, glasses are a medical device. In order to get the best vision possible, keep in mind that some shapes and materials will be better than others depending on your prescription type, how strong it is, and whether it's negative or positive. With a standard prescription, you have the most free range in choice of styles. However, see below if you have a strong prescription. Bifocal lenses have two different prescriptions in the same lens, so you need to ensure that each prescription has enough room within the lens. With progressives, there are three different areas of vision: distance, intermediate, and near. As with bifocal lenses, you must ensure the frame is tall enough to allow for all three focal points. Remember: Make sure progressive glasses are tall enough to enable the full range of the prescription. How strong is your prescription? Stronger prescriptions cause your lens to get thicker. Look for high index lenses to get the thinnest lens possible for your prescription. 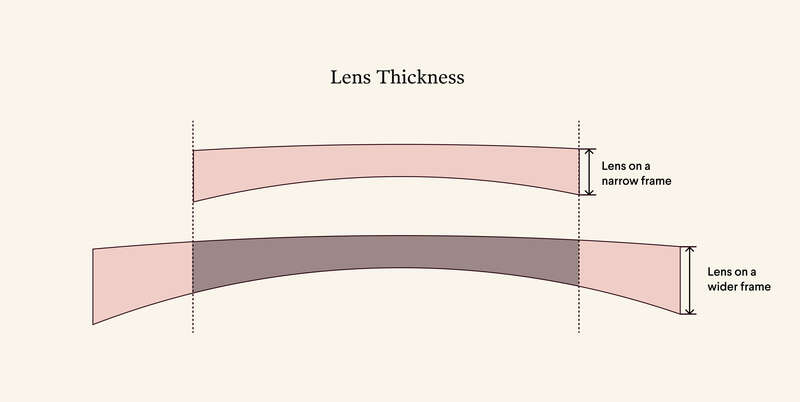 This demonstrates how your lens increases in thickness as a frame becomes wider. Remember: Stronger prescriptions demand smaller frames. Plastic is best. High positive prescription lenses are thickest at the midpoint and thinner at the edges, which can result in a "bug-eyed effect." Avoid bigger lenses that will cause more distorted magnification. High negative prescription lenses are thin at the midpoint and thicker at the outer edges. This can cause the thick lens to peek out at the side of the glasses. Opt for a shorter frame instead of a extremely tall one. Remember: "+" prescriptions make your eyes look bigger, "-" prescriptions make them look smaller. The position of your eyes between your nose and temple is important to consider. For both looks and lens placement, your eye should sit at the horizontal center of the lens and vertically in the top third. Perfect. Both their eyes are vertically in the top third of the lens, and horizontally close to center. The fit of your glasses simply looks better the closer your eyes are to the corner of the lens. When your eyes sit in the inner corner, it can make you appear cross eyed. Too far out and it looks like your frame is too small for your face. If you have narrow-set eyes, be careful. If your frame gets too wide, you'll look cross-eyed! Left: Too much glasses, not enough face. The lens is too wide and his eyes appear cramped in the corner. Right: Much better. The round lens shape cuts off the excess material around the outer corners and balances his pointed chin. Your frame should rest with equal weight on your ears and nose, gripping your temples lightly. You can see the correct fit visually when the width of the frame is equal to the width of your face from ear to ear, and there is no gap, or only a very slight gap, between the top of your nose and the bridge of the frame. 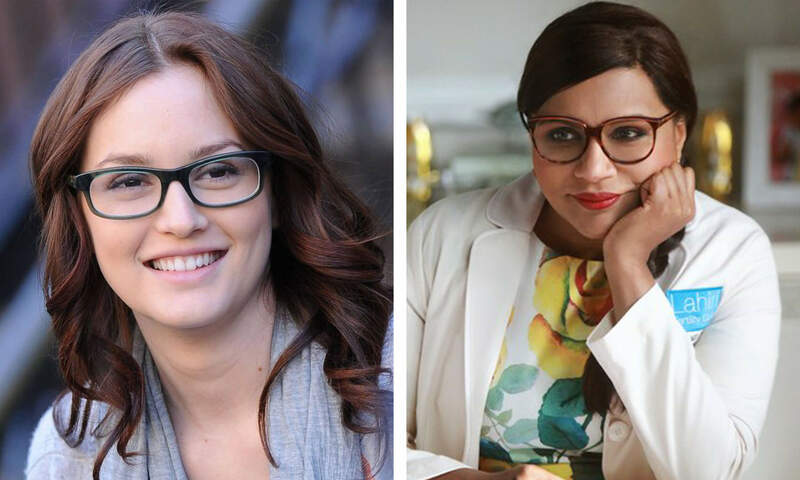 Leighton Meester and Mindy Kaling's glasses are the correct width for their face, allowing their glasses to stay put on their noses. Too wide, and there will be no grip on your temple; the frame will sit heavy on your nose and leave a mark. If the frame is too wide and you have a lower nose bridge, the frame will constantly slip out of place. Too narrow, and the temples will pinch the side of your face and leave painful red marks. If in doubt, size your frame to your eyes - meaning follow our rule above about keeping your eyes up and center! Bonus tip: Beware the selfie distortion. Always use a mirror. You get a few minutes in store to test drive something you're going to wear for an about 16 hours a day for an average of 2 years. It's important to check for these warning signs that will help you detect if the pair of glasses you're trying will fit and be comfortable day in and day out. To stay in place, your frame needs something to hold on to. That’s why it is crucial to find a frame that is the same width as your face, with a comfortable fit for your nose. Left: With too much space between nose and frame, these will likely slide out of place. Right: Good impact, but better fit on the bridge of her nose. The frame temples are also perfectly parallel to the side of her face. Tilt your head forward and shake vigorously from side to side. Proper fit frames should not slide down. If your frames fail the head shake test, it's a good indication that they will continue to slide down your nose forever after. If your frames slide down your nose when you're cool and dry, they'll be a nightmare when you're hot and sweaty! Put your glasses on and pay attention to the amount of pressure present where the temples of the glasses sit above and behind your ears. Assuming they didn't fail the head shake, they are probably not too loose, but might be too tight. If it feels even a little tight you might have a problem. Also, rememebr that when your prescription lenses are inserted, strong negative prescriptions will make the frame flatter, and the temples will splay wider. If in doubt, don't risk it. Make sure that your glasses don't rest on your cheeks. Feel whether your eyelashes are touching your lenses. Remember your prescription lenses may be thicker, and therefore closer to your lashes than the demo lenses in store. Only you should bat your lashes - don't let your glasses do it for you! Shopping for and choosing glasses can be hard work, and it is tempting to give up and compromise. Don't! There is no product you own that is more important than your eyewear. Your glasses are both how you see the world and how the world sees you. Glasses should fit you, not the other way round. Never squeeze yourself into someone else's fit. 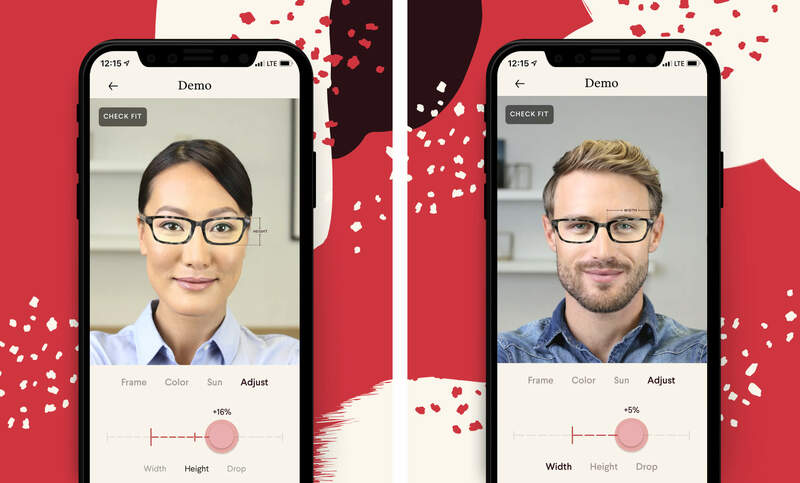 When you style eyeglasses or sunglasses using Topology for iOS, we take care of the fit for you. Every pair you view is instantly auto-fit to your unique size and shape, even with the nose bridges custom sculpted to fit the unique contours of your nose. 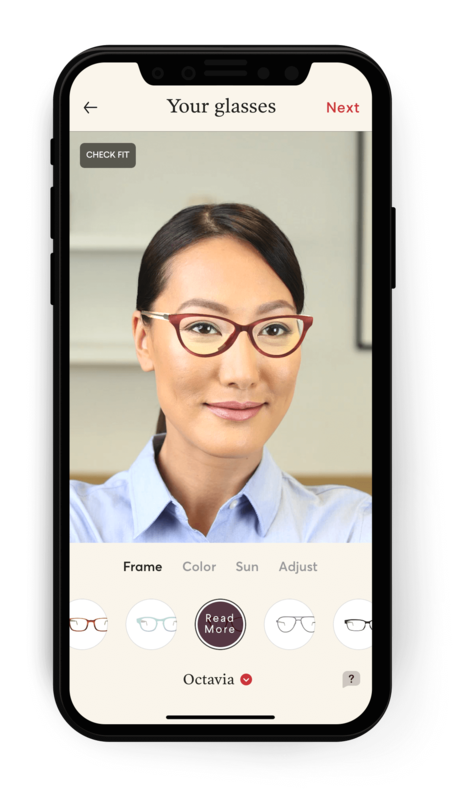 Glasses that fit perfectly not only look better and are more comfortable, but also feel lighter and can be worn for longer, because the weight of the frame is more evenly distributed on your face. Finally, a perfect fit also means no slippage, which means no more pushing them back up your nose. 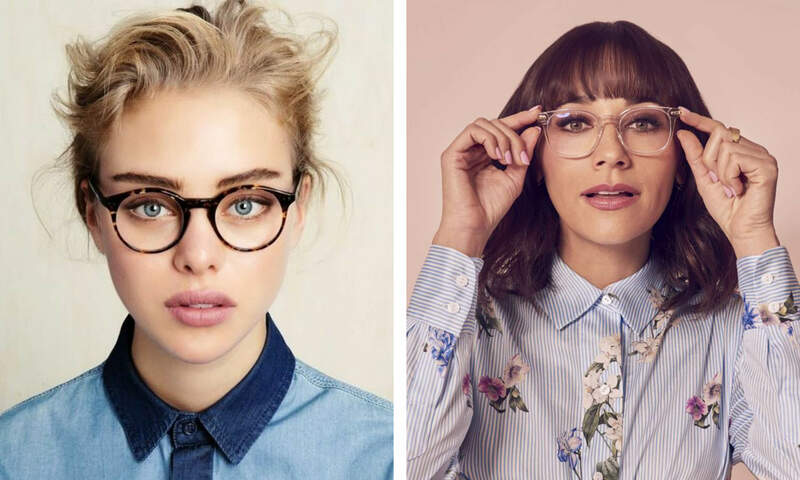 So, if you have ever wanted to try an oversized frame, or rock something a little bigger and bolder than usual, now is the time. Download our app today to get started! Text me a link to the app! Is This Bespoke, Custom, Made-to-Measure, Couture or Personalized Eyewear?